Munster Junior Football Champions 2018!! On Tuesday the 8th of May, Scoil Pol, Kilfinane took on Scoil Mhuire, Béal Átha'n Ghaorthaidh in the Munster Junior football final in Mallow. In front of a sizable crowd, both teams delivered exciting football that was played with a high intensity. Playing with the aid of a stiff breeze, it was Scoil Pol who settled into the game faster. After exchanging points in the opening minutes, Scoil Pol took control with a clinical fifteen minute spell which saw them move into a commanding nine point lead with goals from Laoise Browne and a brace from Sinead Halpin. Despite the Limerick side's dominance on the scoreboard, Scoil Mhuire worked a number of chances moving the ball quickly through their halfback line and midfield before hitting quick ball into their inside forwards. However, they failed to capitalise on these chances, leaving them trailing by nine points with less than ten minutes left in the first half. As halftime approached, the momentum of the match swung in favour of Béal Atha'n Ghaorthaidh, with Scoil Pol's scores drying up after hitting the crossbar no less than four times. The Cork side, after some quick passing and powerful running from their midfield duo Caitlin Ni Mhathúna and Eilie Ní Laoire, hit two quick goals to leave just three between the teams at the break. The second half started with a similar intensity as the first with both sides quickly exchanging points. From this point on however, Scoil Pól began to dominate proceedings with scores from Laoise Brwon, Katie O'Connor, Eibhlis Lee, Emma Barrett and Sinead Halpin stretching their advantage. Scoil Mhuire pushed hard to reply, but Scoil Pól held firm with dogged tackling and pressure from their defence while captain Rachel Condon lead by example in sweeping up loose ball and delivering it to the forward line. Although the weather deteriorated, the standard of football contuined to shine with both teams continuing to play with high intensity. However, it was to be Scoil Pól's day, with further scores from Sinead Halpin, Eibhlis Lee, Phena Herbert, Rose Hyland and Emma Barrett guaranteeing the cup would be heading to Limerick on a final score of Scoil Pól 5-12 Scoil Mhuire 2-06. The Scoil Pól 1st year Ladies Football team took part in the Munster 1st year blitz in Mallow on Wednesday 2nd May. They beat Coláiste Mhuire Cork in the semi final and defeated Caimins College Shannon to win the final with a score line of 5-4 / 1-0. The future of ladies football in Scoil Pól is bright & strong. Well done girls. U16 Limerick County B Winners April 30th! Scoil Pól U16 Ladies Football team beat Desmond College in Rathkeale on Monday 30th April to win the Limerick County B Title. 1st & 2nd year ladies football team that won the Castletroy College Munster Blitz on Thursday the 15th March 2018. Training for the new football season resumed the ﬁrst week of September. On the back of our Munster win last year, the popularity of ladies football was very evident; a 40 strong panel of junior & senior girls showed for training. Mr Somers, Mr Walsh and Ms Fitzgerald were delighted and were very hopeful of another successful year. Scoil Pól had been promoted to division D in both senior & junior grades due to our win last year. We had some wins and losses but managed to get to the quarter ﬁnal stages in both grades. The juniors won their 1/4 ﬁnal against Kanturk, and were to play Kilenaule in the semiﬁnal. Kilenaule were unable to ﬁeld a team and so we were once again in a Munster ﬁnal. The junior D ﬁnal was ﬁxed for the 3rd of February in Martinstown GAA pitch. Our junior girls were well prepared and looking forward to the match, but on the day, the girls of Fethard were too strong and Scoil Pól now looked to the senior footballers for Munster glory. The senior girls beat our old rivals CTI Clonmel in the D plate semiﬁnal after loosing their 1/4 ﬁnal in the senior D cup competition. Scoil Pól will play Colaiste Craobhin Fermoy in the Munster D plate ﬁnal on the 2nd of March in Manix College Charleville. We wish our girls the very best of luck and look forward to a great match and hopefully victory for Scoil Pól. Munster Finalists 2016 pictured with Kerry footballer Colm Cooper. Ladies Win Jnr Football Munster Final! On Thursday 5th of February, the Junior Munster Ladies Football Final between Scoil Pol (Limerick) and Gaelcoláiste Mhuire (Cork) took place in Charleville. Little over a week since their disappointing loss in the senior ladies final, the girls of Scoil Pol bounced back with an impressive performance against a skilful and resilient Cork side. Despite the terrible weather endured over the past number of weeks the excellently maintained pitch at Charleville allowed both teams to play a skilful and high tempo brand of football. It was Scoil Pol who, aided with the wind, started much brighter with four unanswered points. Despite the constant pressure, Gaelcoláiste’s defence worked tirelessly in closing down space and tackling, providing limited scoring chances to the Scoil Pol forwards. The first term has been very busy for all involved in GAA activities in school. We kicked off the year on a very positive note by hosting the Tommy McCarthy Memorial Hurling Blitz for Primary schools. Over 120 players enjoyed a training session and a fantastic competition. The A division was won by Bruff, the B division by Bulgaden/Martinstown & the C division by Glenbrohane. Thanks to all who helped to organise the Blitz and all who participated. The U18 Hurling team faced Kilmallock in the first round of the hurling championship, despite a brilliant performance the lads were narrowly defeated in a very entertaining game. Our senior team continue to train as they await the draw for the second round. The U 14 Hurling team participated in a First Year Blitz held at Old Christians GAA grounds. We were victorious against Scoil Mhuire, Askeaton and St Clements, while being narrowly defeated by SMI Newcastle West. Well done to all who participated. Monday morning in Scoil Pól, and the excitement was palpable, the under 14 hurling team were in a county final. All onto the bus at 12 noon, only an hour to throw in against St. John the Baptist Hosptial. The mentors Mr. Mike Organ and Mr. Dan Somers spoke to their charges about the game plan and the important role each player had in representing Scoil Pól. Scoil Pól captain Kevin O'Farrell won the toss and elected to play with the wind. The ball was thrown in and a great cheer was heard from the Scoil Pól supporters in the stand in Bruff. John the Baptist were first to register a couple of points. But Scoil Pól settled quickly and Ed Valatka put Kilfinane on the score board, with two points. Darren McCarthy started a scoring spree for Scoil Pól with one goal and two points from himself and another 2 points from Valatka. At half time Scoil Pól lead 1-9 to 2points. The second half started well for Hospital with them scoring 1-2 very quickly. Scoil Pól replied with 2 points from Ed Valatka and a goal from Patrick Ahern. The game got very exciting with Hosptial scoring 2 goals and 2 points and Scoil Pól 1 goal. Strategic positional changes were made by Scoil Pól to stop the Hospital come back. Dylan O'Connell, Katie Hennessy and Jason Penny were just a number of Scoil Pól players who showed great steel at this point. The score of the match was scored by Shannon O'Doherty as she put a 25 yard goal into the Hospital net, to seal the game for Scoil Pól. Final score Scoil Pól 4-13 St. John the Baptist 3-8. Congratulations to the entire panel for a glorious and well deserved win. We were delighted to welcome James Ryan to our school on 28th November 2017, where he ran a football blitz in the school. The Scoil Pol Girls Chess Team won the All Ireland Secondary School Girls Chess Title for the second year in a row in May 2010. The team was Jennifer Halpin, Ellen Casey, Niamh Weeks and Clodagh Hennessy. The competition was run as an individual five round swiss tournament with the individual results added together to make the team score, and with each girl winning four out of five matches, they won the title with a score of 16 points, with Carrick-on-Suir in second place on 13 ½ points and Drogheda third on 12 points. Individual Prizes were also awarded with Sarah Jane Hearne from Carrick-on-Suir in 1st place. The four Scoil Pol Girls, along with Megan DeSousa from Drogheda, all tied in 2nd place, which called for a tie break and resulted in Megan DeSousa being awarded 2nd place and Niamh Weeks from Scoil Pol came 3rd. Allow us to introduce you to our All Ireland Junior Champions!!!! What an amazing day! What a group! Final score Scoil Pól 3-6 St. Colms 1-3. We are beyond proud of these grils and their coaches Mrs. O' Riordan, Sr. Patricia, and Ms. Collins. A huge well done to all involved. Click on photo to flick through the photos of our famous victory! Junior All Ireland Semi Final Winners 2019!! The jerseys are washed and ready for the All Ireland Junior Camogie Semi Final having had a comprehensive win over St. Louis, Rathmines today with a scoreline of Scoil Pol 15-11 St. Louis 0-1. Heartfelt thanks to the wonderful team, helpers, families, friends and many supporters that showed up in force today! As the saying goes "it takes a community to raise a child" and were we delighted and thankful to have you all there!! Huge thanks also to Effin Gaa for use of pitch and facilities! All roads leading to Laois for the All Ireland Semi Final, venue and time tbc! Maith sibh arís gach duine! Scoil Pól Abú!!! Here is a gallery from both the Munster Final and All Ireland Quarter Final in 2019! Congratulations to the victorious Junior camogie team in Scoil Pól on beating Ardscoil Dungarvan on Tuesday last to be crowned Munster champions. In dreadful conditions in Blackrock pitch, through hail, sleet and snow the Scoil Pól girls showed their true grit in overcoming a strong Waterford side on a scoreline of 0-10 to 1-3. The girls now advance to an All Ireland 1/4 Final on Monday 4th February against the Dublin Champions St. Louis, of Rathmines. This game will be played in Effin Gaa pitch at 1pm on Monday. Please come along and support the girls in their quest!!! Wednesday, 9th of May began with mist, fog, rain and hail. Terrible conditions for our Munster minor blitz. The girls geared themselves up for a run of gruelling matches. Starting off against near neighbours Buttevant. The girls dug deep but wasn't enough and were defeated by a single point. Next up was SMI from Newcastle West. After a slow start Scoil Pól stormed to a commanding lead and won out on a scoreline of, 5-1 to 2-1. We then played Mount Hawk, Tralee in the quarter final. The Scoil Pól girls were really on a mission and finished with a resounding victory of 6-1 to 0-0. Semi final we met Coláiste an Chraoibin and despite the hailstones Scoil Pól were victorious 4-3 to 0-0. Our opponents for the final were Waterpark from Waterford. All teams were getting tired as the day progressed but we hoped we had enough fuel in the tanks for just one more win. The sun made a welcome appearance after all the rain and Kilfinane once again powered on showing no sign of weakness. Final score 3-5 to 0-1. Clíodhna ó Sullivan was gracious in accepting the Munster minor cup for the second consecutive year. Wednesday, 9th of May began with mist, fog, rain and hail. Terrible conditions for our Munster minor blitz. The girls geared themselves up for a run of gruelling matches. Starting off against near neighbours Buttevant. The girls dug deep but wasn't enough and were defeated by a single point. Next up was SMI from Newcastle West. After a slow start Scoil Pól stormed to a commanding lead and won out on a scoreline of, 5-1 to 2-1. We then played Mount Hawk, Tralee in the quarter final. The Scoil Pól girls were really on a mission and finished with a resounding victory of 6-1 to 0-0. Semi final we met Coláiste an Chraoibin and despite the hailstones Scoil Pól were victorious 4-3 to 0-0. Our opponents for the final were Waterpark from Waterford. All teams were getting tired as the day progressed but we hoped we had enough fuel in the tanks for just one more win. The sun made a welcome appearance after all the rain and Kilfinane once again powered on showing no sign of weakness. Final score 3-5 to 0-1. Clíodhna ó Sullivan was gracious in accepting the Munster minor cup for the second consecutive year. Many thanks to our wonderful referees on the day Jack ó Reilly, Jimmy Quilty, and Mike Meade. Munster U16 1/2 final winners! Saturday February 3rd was a day that will live in the memory of the Scoil Pól camogie team for a long time to come. The stage was set for the Munster U16 1/2 final between Coláiste Íde agus Íosaef of Abbeyfeale and Scoil Pól Kilfinane. Mannix college pitch provided the venue and compliments must be forthcoming for the excellent condition the pitch was in despite the inclement weather leading up to Saturdays final. At 11.30 the sliotar was thrown in and Scoil Pól got off to a blistering start. The first two attacks yielded 1-1 with the goal coming from quick thinking full forward Róisín ó Riordan. Scoil Pól played with the aid of a strong breeze in the first half and their defense was well marshalled by Denise Mullins at full back. Scoil Pól made the most of conditions and led at half time by 3-3 to 1-1. Abbeyfeale came out fighting in the second half and applied great pressure. They were rewarded by scoring 2-3 in the second half. However it wasn't to be their day. Both sides fought extremely hard and emptied the tanks on the pitch. Despite huge pressure from an excellent Abbeyfeale team, Scoil Pól managed to hold out and win a historic munster title. Captain Katie O Connor accepted the cup and thanked everybody for their contribution. Final score 4-5 to 1-1. Team: S. O'Brien, A. O'Connor, D. Mullins, R. Walsh, L. O'Connor, É. Lee, M. English, A. Cronin, C. O’Sullivan, C. O'Dwyer, C. O’Riordan A. Meade, K. O’Connor, R. O’Riordan, H. McCarthy. Subs, S. Litchfield, R. O'Connell, A. Shorthall, É. O’Sullivan, S. Halpin, S. Hayes, C. Quane, L. Prendergast, R. Condon and Janelle Zion. Team management: Sarah Collins, Noreen O Riordan and Sr. Patricia Coughlan. Scoil Pol camogie is going from strength to strength of late with some great successes and silverware being earned by the girls. First up was the Munster u16 1/2 blitz which was hosted by Borrisoleigh. Having competed in this competition for the last number of years we were quite anxious that one of these years we would finally prove our worth and win the title. However, seeing the group we had drawn we were instantly aware of the challenge that lay ahead. After losing our captain Roisin O'Riordan through injury in the first game a gallant Amy O Connor proudly took over the captaincy role. Never lacking enthusiasm and drive Amy led the troops to victory in every game we played. On our journey we defeated Newport college, St Anne’s Tipperary, Borrisoleigh B, which lead us to play Borrisoleigh A team in the final. The stage was set and we knew Borrisoleigh were not going to be easy opponents to defeat. After a very intense first half Scoil Pol was only 2 points ahead at half time. Playing with a strong breeze in the second half the scoil Pol girls went into a commanding lead and won out by 5-7 to 2-2. The Borrisoleigh Blitz winning team 2017! Our minor team(first and second years) attended the annual blitz in Rathkeale on October 24th. Playing seven aside competitions always requires a huge team effort and a well balanced side which is what we had heading for the Rathkeale pilgrimage. First up was Kilmallock on the AstroTurf who provided a very tough game for us and fortunately we oversaw them to play next opponents SMI newcastle West. We really were on a role having defeated both these teams and then faced Castletroy college, Newport College and Desmond College. As we topped our group we were awaiting the decider between Desmond and Castletroy college to see who we would meet in the final. Our minor team(first and second years) attended the annual blitz in Rathkeale on October 24th. Playing seven aside competitions always requires a huge team effort and a well balanced side which is what we had heading for the Rathkeale pilgrimage. First up was Kilmallock on the AstroTurf who provided a very tough game for us and fortunately we oversaw them to play next opponents SMI newcastle West. We really were on a role having defeated both these teams and then faced Castletroy college, Newport College and Desmond College. As we topped our group we were awaiting the decider between Desmond and Castletroy college to see who we would meet in the final. Scoil Pol girls were lucky enough to get a little break before the final and after some regrouping and team building games we were ready to face the challenge of Desmond college in the final. A massive team performance and plenty of substitutions ensured the victory over Desmond after a long, tiring yet successful day. Aoife Cronin accepted the trophy and gave a superb speech to finish off a fantastic day of camogie. The Rathkeale Blitz winning team 2017! SCOIL Pol won the Munster Camogie under-16.5 ‘B’ North title after a strong second half display saw them overcome Presentation, Mitchelstown in an entertaining final in Kilfinane. Trailing 1-3 to 0-3 at the interval, Scoil Pol showed great passion and determination in the second period to ensure that they left with the Sr Patricia Cup. Great displays from Aoife Cronin and Katie O’Connor in attack were vital for the south Limerick school in this victory. Also crucial for the winners was the solid display of their full back line, which consisted of Brooke O’Dea, Rachel Condon and Clodagh O’Brien. However, they were almost outdone by a Presentation side who had some stars of their own. Centre back Aine Keating, Shona Lang and Sally McCarthy in particular did everything in their power to ensure that the supporters who had travelled in support of the north Cork school would leave the happier. McCarthy was the scorer-in-chief for Mitchelstown with her goal coming from a free. While it wasn’t her best strike of the afternoon, it had enough power to end up in the back of the net for the score which separated the sides at the half time whistle. However, Scoil Pol, backboned with players from Blackrock-Effin and Galbally scored 1-5 in the second half in a strong display to see them over the line. Katie O’Connor got their first goal with a super strike to give the Limerick side the lead for the first time. The second goal came with under 15 minutes to play as Aoife Cronin – the lone Kilmallock player in the line-up – got the crucial score for the side with Noreen O’Riordan, Sarah Collins and Sr Patricia on their management team. Despite their best efforts, Presentation couldn’t get the goal they needed to get back into the game. While they were struggling to score at one end, the free-taking of Denise Mullins kept the board ticking for the Kilfinane school who ran out seven point victors. SCORERS: Scoil Pol, Kilfinane: Aoife Cronin, Katie O’Connor 1-2 each; Denise Mullins 0-4 (0-2 45s, 0-1 free, 0-1 pen). SCOIL POL: Roisin O’Riordan; Brooke O’Dea, Rachel Condon, Clodagh O’Brien; Leah O’Sullivan, Denise Mullins, Eibhlis Lee; Claire O’Dwyer, Rachel Walsh; Aoife Cronin, Ellie Quilty, Roisin Tan; Katie O’Connor, Sineal Halpin, Sinead Walsh. PRESENTATION, MITCHELSTOWN: Chloe Barry; Aniva Corbett, Maura O’Doherty, Aoife Hanrahan; Shauna Cremin, Aine Keating, Shauna Maher; Lauren O’Brien, Sarah Kent; Shona Lang, Sally McCarthy, Marie Buckley; Seana Hurley, Anna Murphy, Siobhan Moran. Picture of Scoil Pol Munster Camogie Intermediate finalists that were unfortunately beaten by Causeway Comprehensive School last Saturday. Played in Kilmoyley, the Kilfinane ladies fought to the end and showed tremendous spirit and pride in the school jersey. Well done to the amazing Scoil Pól U16 1/2 girls camogie who are going from strength to strength. On March 16th 2016 the team travelled to St Mary's secondary school Mallow to compete in the annual 10 aside blitz in our division. The girls as usual being eager to perform and hungry for success started off playing in the pool stages against Waterpark College, Coláiste an Chraoibhín, and Presentation Clonmel. Knowing we needed to win each of the pool games it was vital that we rotate all the girls on the panel as much as possible and avoid their legs getting tired. The girls really rose to each challenge that was put to them and were strong enough to see off all the challenges including a very determined and physical team from Regina Mundi in Cork in the final. Clodagh O Brien graciously accepted the cup on behalf of her team mates. A well deserved piece of silverware to finish off their year. We are so proud of you for your commitment, dedication and your resilience and your refusal to give up. Comhghairdeas libh. We would also like to congratulate Kristy Carroll who captained the Limerick U18 Camogie team to All Ireland glory and our Senior Camogie Team made a very successful start to the season with a comprehensive victory over Castletroy College. 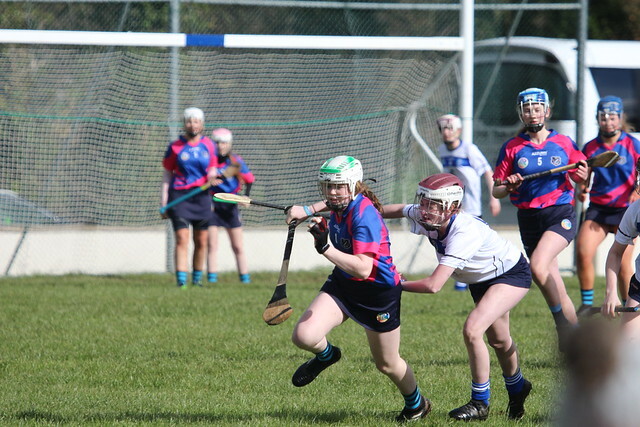 Well done to the Under 16 camogie girls on their recent performances! On Wednesday November 16th we travelled to Eire Óg's pitch in Ennis where we played against Coláiste Ennis in the North Munster semi-final. The standard of play was very high. Although the Scoil Pól backs were under immense pressure from the moment the ball was thrown in, they just were not able to fend off the fierce attack from Coláiste Mhuire's forwards. The girls battled hard from start to finish but unfortunately were defeated by a very strong team from Ennis. On Tuesday 22nd November the Under 16 ½ girls travelled to Mallow GAA complex to compete in the Munster Colleges blitz. Ten teams took part including Dingle, Gaelcholáiste Luimní, North presentation (Cork) and Coláiste Chiaráin Croom. The girls looked very smart in their new jerseys which were worn with pride and they did a great job in representing and promoting Scoil Pól. The Scoil Pól girls defeated AG Coláiste, Coláiste Chiaráin and Corbally in the group stage which saw them advance to the semi final of the competition where they played Gaelcholáiste Luimní. This was a very tough game and the determination of Ellen Casey and her team mates proved too much for the city school. Then Pallaskenry awaited in the final. Having played four games at this point both teams were feeling tired but none were willing to give up. Great performances by Katie Hennessy in mid-field and Noelle Carroll full forward put Pallaskenry under pressure from the off however when the final whistle blew, Pallaskenry were fortunate enough to lift the cup with a win by a mere 2 points. Congratulations to the girls on a very fine display and best of luck in the upcoming games. Congratulations also to the Senior Girls who have defeated Castletroy in the 1st round and North Presentation in the 2nd round to advance to the Munster semi-final of the Hayes Tournament. Although North pres were a very physical side they never looked like winning with our strong defence of Ellen, Maria, Aisling, Jess and Ashley Carroll (captain). The mid-field trio of Shannon, Sinéad and Jennifer worked tirelessly throughout. In wet and windy conditions without a doubt the forwards Niamh, Lisa, Eimear, Clíona,Tara and Kristy were outstanding. Well done also to an injured Katie who played in goals for the game v North pres. We might have found a new position for Katie after her performance!! !